Monet, Van Gogh, Matisse, Picasso, Cezanne. These are all names that you have heard in art class, and when you imagine where their work exists today, you probably think of a museum surrounded by security cameras and guards. But for years, dozens of these priceless works of art were hanging in one man’s home: Albert C. Barnes. Barnes was a wealthy chemist whose life was an all-American rags- to-riches story. He collected artwork from Europe, and when those artists became famous later on, they became priceless treasures. Instead of hiding his collection behind closed doors, Barnes invited people into his home to see them, so long as they made an appointment first. In his last will and testament, he explicitly stated that he did not want the art to leave his house. 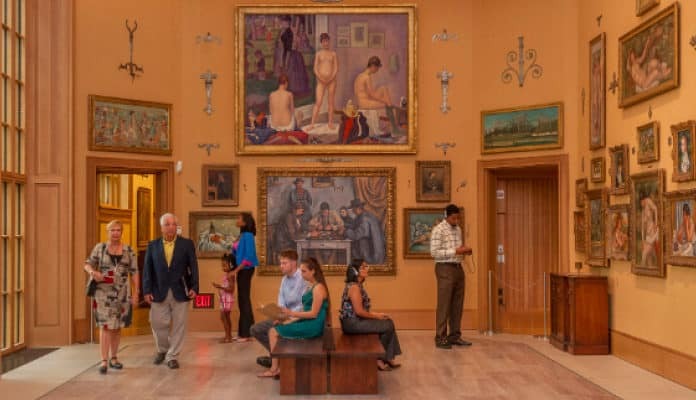 Since he never had kids, it became the property of The Barnes Foundation. However, a few years after he died, the city of Philadelphia came after his paintings. Albert C. Barnes grew up in a very poor part of South Philadelphia that was known as “The Dumps”, and he was one of the very few white children living there after the Civil War. His father was a disabled war veteran, and his mother did her best to feed the family with their meager $8/month disability pension. He witnessed first-hand how much injustice there was in the city, and how badly poor people were treated by authorities. He knew that the only way he could possibly escape a life of poverty would be to study hard and get good grades. He was accepted into the competitive Central High School, which lead to him getting accepted to the Ivy League University of Pennsylvania. As you can imagine, his tuition was expensive, even back in the 1800’s. There was no way his parents could afford to send him there, so Barnes earned money by becoming a professional boxer, baseball player, and tutor for some of the rich kids in his classes. When he grew up, Albert C. Barnes became a chemist, and he traveled back and forth to Germany in order to work in some of the best laboratories in the world. Together with a friend named Hermann Hill, they invented an antiseptic made with silver nitrate called “Argyrol”. Its original purpose was to drop into baby’s eyes when they were born with sexually transmitted disease like gonorrhea from their mother. Albert Barnes bought Hermann’s share in the company, and he moved back to the United States to open a corporation called The A.C. Barnes Company. He manufactured and sold the argyrol to doctors and hospitals all over the world. Since he grew up in a poor Philadelphia neighborhood, Albert Barnes knew from first-hand experience how difficult it was for minorities to get out of their circumstances, receive a good education, and find a high-paying job. He wanted to help end the cycle of poverty by giving job opportunities to the black community. Nearly everyone he employed at his factory and laboratory was African American. At the end of every work day, he offered 2 hours of free classes in nearly every subject- philosophy, art, psychology, and more. This way, his staff was able to receive the equivalent of a college education for free. Before Barnes invented Argyrol, babies born with gonorrhea would go blind. It was also used for a variety of other eye and sinus infections. So, his formula became incredibly valuable. In 1929, a company bought the Argyrol company from Barnes for a huge sum of money, which is very lucky on his part, because the stock market crashed almost immediately after. It was like he was receiving the best kind of karma in the world for all of his good deeds, and he was able to completely avoid losing money during The Great Depression.